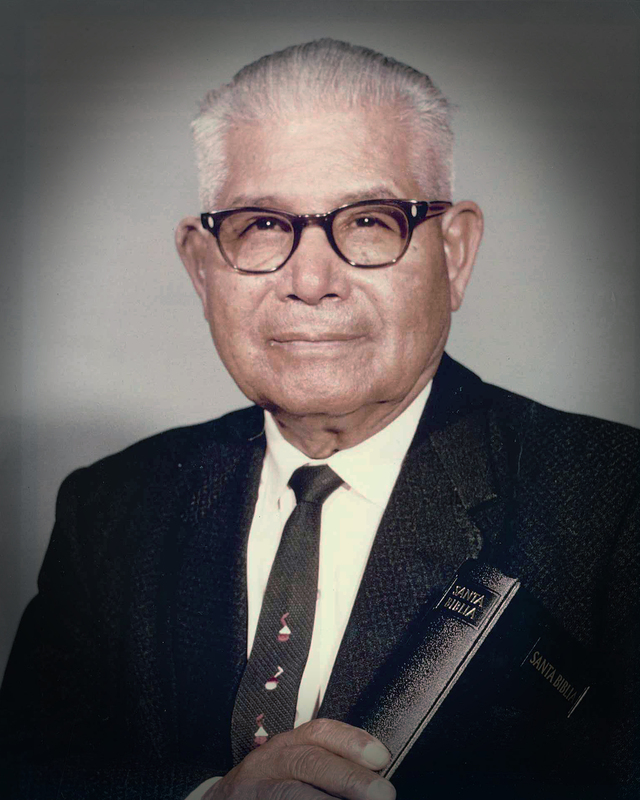 Antonio Castañeda Nava (1892 – 1999) born October 4, 1892 in Durango’s desert in Nazas, was the third Bishop President of the Apostolic Assembly. He has the distinction of being the longest-serving Bishop President. Distinguished hymn writer Marcial de la Cruz, evangelized brother Nava and was his spiritual mentor. While looking for work one day in San Bernardino along with Pioneer de la Cruz, brother Nava was filled with the Holy Spirit and baptized November 23, 1916. Soon after he set himself to preaching and planting churches. The Lord gave him a vision one night of 1925 that the new Apostolic Hispanic churches should organize; as such he planned the first General Convention in 1925. Bishop Nava married his wife Dolores Ochoa in 1933. His ministry crossed borders; he was instrumental in organizing the “Iglesia Apostólica” in Mexico by providing orientation to their first Bishop President, Pioneer Felipe Rivas, and credentials to Mexican ministers. The Ministerial Body gave its overwhelming support and vote of confidence to pioneer Nava in 1929 upon his return from México and at the wake of the Great Depression. The Lord was with Bishop Nava, his ministry had many miracles and healings. He presided the Apostolic Assembly in the decades when the Church faced forced repatriation, terrible poverty, and the Second World War. His achievements include incorporating the Apostolic Assembly in 1930, the first Constitution, the first Hymnal, the celebration of the Apostolic Assembly’s 50th Anniversary, the International Apostolic Bible College, the auxiliaries, and the publishing of the Apostolic Herald. Pioneer Nava was also a hymn writer; he composed “El Nombre del Mesias” which is the Apostolic Assembly’s anthem. He rested in the Lord full of days at the age of 106 on August 10, 1999.